2,4-D Resistant GMO Crops Appear Imminent, What are the Dangers? One of the primary dangers of genetically modifying crops to pair with a pesticide is that it encourages the over-use of that pesticide and the development of super-pests. Overuse of a pesticide kills all but a resistant minority of pests and, after several generations, this causes it to become ineffective. Once a pest population is resistant to a pesticide, an even more powerful pesticide (or simply more effective) is required—this progression creates an ever-escalating chemical arms war between nature and farmers. Currently, the most common GMO crop is the RoundUp Ready GM Corn produced by Monsanto. According to the most recent FDA report on GMOs in the USA, 85% of corn production in the USA is “herbicide tolerant” (I.E. it has been genetically modified to pair with glyphosate pesticides). GMO corn currently uses glyphosates to kill all pests that would normally grow in the corn field alongside the crops. Unfortunately, it appears that the GMO manufacturers anticipate a need to increase the power of the pesticide paired with their crop so that they will remain effective. The new pesticide paired with GM corn is 2,4-d, which is best known for being the “less-toxic” component of the now-infamous “agent orange” defoliant agent used during the Vietnam war. Originally, developed during WWII as a chemical weapon (that was never employed), 2,4-D entered the private market in 1945. It was marketed as an effective, safe and cheap weed killer that could be applied by untrained individuals. Eventually, it became infamous for its inclusion in the deadly chemical defoliant “Agent Orange,” used to destroy Vietnamese forests during the Vietnam War. Currently, 2,4-d is used as an agricultural herbicide, on golf courses/parks, and is sold as a consumer pest control. It is seen as one of the less toxic chemical pesticides and is easily accessible. According to the official NPIC fact-sheet, 2,4-d can cause renal failure if the amount consumed exceeds the filtration capacity of the kidneys. “Dose-dependent toxic effects include damage to the eye, thyroid, kidney, adrenals, and ovaries or testes. In addition, researchers have observed neurotoxicity, reproductive toxicity, and developmental toxicity.” Finally, 2,4-d causes endocrine disruption disorders and, according to some studies, is linked to cancer and neurodegenerative diseases like Parkinson’s. In short, 2,4-d can cause serious damage to multiple vital systems in the human body if it is applied in significant doses. It can be inhaled, consumed, absorbed through mucus membranes, or even absorbed through the skin. Dow Chemical has started to produce GMO corn and soybeans that are resistant to 2,4-d. These crops have been approved by the USDA (here is a link to their 2013 petition to the USDA) but have yet to actually reach the market. This approval occurred despite significant outcry from environmentalists, concerned citizens, and even medical professionals (here is a link to a letter signed by 70 doctors imploring the USDA to reject Dow’s request for approval). The resistance to 2,4-d gained by GMO crops will allow farmers to deliver massive doses of the pesticide to their fields in order to ensure that the only things growing are their crops. In this study, 2,4-d was applied to the field at a volume that would kill any plant that has not been designed specifically to tolerate such a high dose. 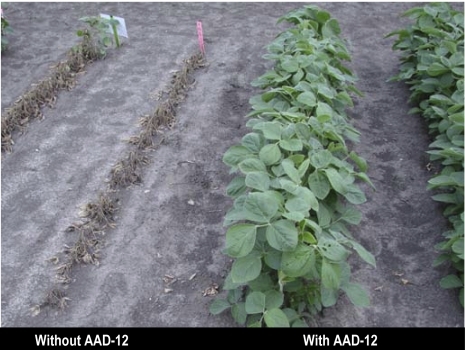 The corn and soybeans modified with the AAD-12 gene—an enzyme that degrades 2,4-d in the plant, thus rendering it far less harmful—survived while every other plant was absolutely devastated. According to the FDA’s analysis of the AAD-12 gene, it is degraded during digestion and doesn’t have any identified health consequences in and of itself (although current no tests have involved exposing large populations to large quantities of the gene). While many farmers may see such a test as a very positive result from the standpoint of ensuring that their crops aren’t overrun by pests, there are some real dangers inherent to these results. First, there is little guarantee that the pesticides sprayed on the crops at extremely high volumes will be washed off before the crops are sold—this creates the danger of exposing consumers, including the chemically sensitive, to extremely high doses of pesticides. In the past, 2,4-d has been marketed as safe because it isn’t used in doses that cause acute harm to the average human being (although studies have shown that there are dangers inherent to chronic exposure). The development of GMOs that tolerate 2,4-d allows farmers to use far larger quantities of the chemical than are common today (volumes that would defoliate even commercial golf courses that currently use large quantities of 2,4-d), thus increasing the danger that consumers will be exposed to dangerous doses. Second, there is the reality that using such large quantities of a powerful herbicide will inevitably lead to a precipitous drop in biodiversity. 2,4-d is designed to kill plants, and it does its job well. 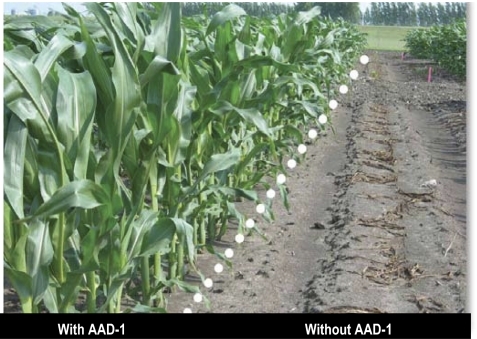 Applying massive amounts of 2,4-d will (as shown in the photos), kill virtually every plant in the area, including non-pests. The liquid runoff and aerosol drift of 2,4-d will cause immense damage to the ecosystems surrounding farms that grow these crops and may very well render large areas fallow except to GMOs designed to tolerate 2,4-d. Finally, the problem of evolved immunity to pesticides isn’t solved by shifting to 2,4-d. In fact, it may make the situation worse. Just as antibiotics breed resistant diseases, pesticides breed resistant pests and, just at the solution to antibiotic resistant bacteria isn’t always just a more powerful antibiotic, the solution to resistant pest may not be upping the power of the pesticide. When pests become resistant to 2,4-d, we will have to up the ante again…and again…and again, until we are forced to deal with the pest equivalent to MRSA (multiple-resistant staph infection). Once this happens, we will be unable to kill the pests without using seriously toxic chemicals that have even worse effects on human health and the environment than the pesticides we use today. According to the International Survey of Herbicide Resistant Weeds, there are currently 437 confirmed cases of pesticides breeding resistant weeds. 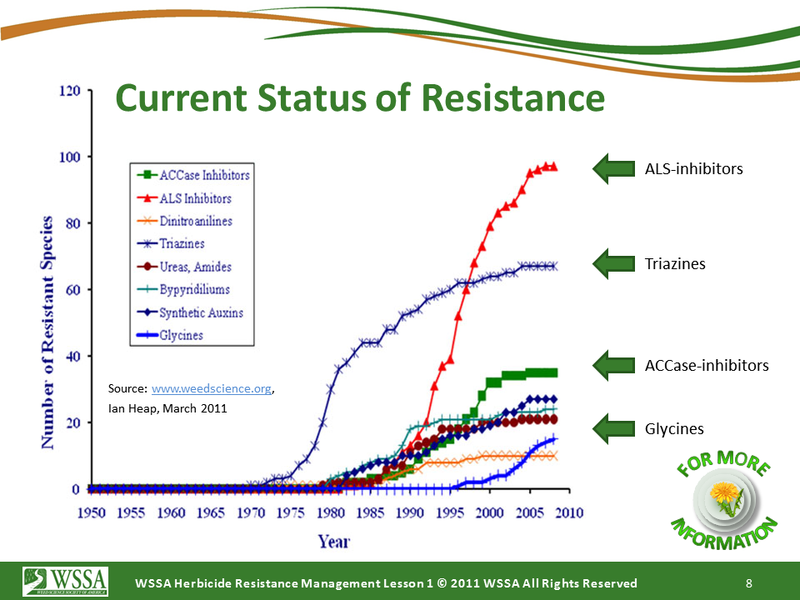 These accumulated resistances have reduced the effectiveness of 155 different herbicides and have involved virtually every class of chemical pesticide. The most effective methods of reducing the dangers of pesticide resistance are to use a mixture of pest-control methods and not relying on mono-cropping farming. Shifting to a slightly more powerful pesticide, or pesticide cocktail, is a temporary fix that just covers up the real problem until it can remerge at a later date, with fewer options as to how to fix it. It is the duty of the FDA and USDA to protect the American people from the potentially damaging actions of corporations. Dow and other GMO/pesticide manufacturers stand to gain large profits from the sale of GMO seeds (they sell both the seeds and the chemicals used on the plants), but the short-term economic gains of these corporations and farmers will likely counterbalanced by long-term harm to our environment and an increased danger to the health of consumers. As such, activists need to continue working to ensure that public officials reconsider their choice to approve these GM crops before real damage is done. Interesting essay. I would like to add two points that I think are relevant. 1. The decimation of the bee population due to pesticides is becoming a real problem. The position of the bees in the chain of life is essential. 2. The GMO industry is fighting and has succeeded in some places to prevent the proper labeling of their products. As a result, the consumer has no idea whether or not they are buying and ingesting GMO foods. The resistance to labeling demonstrates that the industry KNOWS they are producing food products the consumer does not want. While they want the “freedom” to use GMO technology, they would deny the consumer the “freedom” to choose whether or not to buy those foodstuffs. I have long advocated the second point. However, the first point, while important, is tangential to this argument. The destruction of the bee population is believed to be a function of neonicotinoid pesticide overuse, not 2,4-d or glyphosate, which are both aimed primarily at defoliation, not insect control. Regarding my first point. Newer studies are starting to implicate GMOs as a possible contributing factor, as well. “…..Do You Trust Monsanto to Solve the Bee Colony Collapse Problem? Another forerunning theory of colony collapse disorder (CCD) is that it’s being caused by genetically engineered crops—either as a result of the crops themselves or the pesticides and herbicides applied on them, such as Roundup. In one German study,(4 when bees were released in a genetically engineered rapeseed crop, then fed the pollen to younger bees, scientists discovered the bacteria in the guts of the young ones mirrored the same genetic traits as ones found in the GE crop, indicating that horizontal gene transfer had occurred. Chemical companies like Monsanto are clearly seeking to take as much control of the food supply as possible by controlling virtually every aspect of crop production, so research implicating their business as the cause of bee die-offs would definitely cause harm to the company’s bottom line. Monsanto has received increasing amounts of bad publicity over their potential role in the devastating demise of bees around the globe. There is no scientific consensus that the decline in the bee population is the result of pesticide use. Colony collapse disorder is still a mystery. Many think it is caused by modern farming practices that eliminate weedy hedgerows where bees can have access to a greater variety of food. The monocultured fields don’t provide the bees with a properly balanced nutrition. Labeling foods as GMO is unnecessary and alarmist. GMO foods are completely safe for human consumption. It is unfair to force companies to label something that is perfectly safe for human consumption as GMO because so many wrongly think it is unsafe. Marketing is everything. It would be like forcing a company to label their product with the words “poison” when they did not use poison as an ingredient. If you are the same Mark Gelbert who is currently the senior VP of R&D at Pfizer, a company that relies upon GMO bacterium and viruses to make several of your drugs, I understand why you are so pro-GMO. That said, I specifically qualified my argument that bee colony collapse “is believed” to be caused by neonicotides because more study needs to be done–that said, it is the most dominant hypothesis right now. As to GMO labeling, while I understand your stake in this, you need to realize that GMOs are not necessarily safe and that they should be labeled so that people can choose to consume them. As we saw with the brazil-nut soy gene transfer, GMOs can activate allergies in unsuspecting people if they are not labeled properly and the consumer is unlucky. Additionally, we simply don’t have enough knowledge to predict the full consequences of certain modifications, thus should do far more testing before releasing any GMO into the market (currently, a lot skate through while being classified as substantially similar with natural organisms). Mark…there is no scientific “consensus” about anything. There are always a few “scientists-for-hire” who will try to contradict or deny the vast majority of data. The idea that colony collapse is a “mystery” is all the more reason NOT to encourage GMO crops until we do more research, don’t you think? Why forge ahead when you do not understand the implications on bees? If GMO foods are safe, in your opinion, why do you oppose labeling? What harm is done by people making their OWN DECISIONS about what to feed their kids? Are you suggesting people are to stupid to decide for themselves what kinds of foods they want to feed their kids? To suggest that labeling a food product in the same as putting the word “POISON” on it is not even close to being true. As a consumer, don’t I have the right to know what is in my food and the right to decide for myself what kinds of food I want to eat? Are you also suggesting that we eliminate “organic” from the labeling? Why not? Why are you afraid of giving consumers accurate information? My name is Mark Gelbart…not Mark Gelbert. I don’t work for Pfizer. Man, you are a real idiot for that astonishingly stupid assumption. Accusing me of being a corrupt businessman is libelous. It’s not just a few “scientists for hire” who disagree that pesticides are primarily responsible for Colony Collapse Disorder. The use of GMOs has nothing to do with CCD. CCD has occurred for centuries…long before GMOs were invented. I already explained why labeling is unfair. People wrongly think GMOs are harmful when there is absolutely no evidence that they are. There is not a single study that has ever determined that GMOs were harmful to human health.